In the previous weeks we have been working hard to prepare the end of the year website update which will include Academy full reveal and Gamification features. However it seems that this feature still requires a lot of test on our side so we will have to continue our efforts in order to provide you something great in the end :) We will keep you informed about the progress we make and give you a release date as soon as possible! In the meantime, we decided not to make you wait any longer concerning the Academy line-up and offer you what you were really waiting for! Starting today (and finishing tomorrow :)), you will be able to discover the full Academy line-up with official concept arts, lore details and skills. 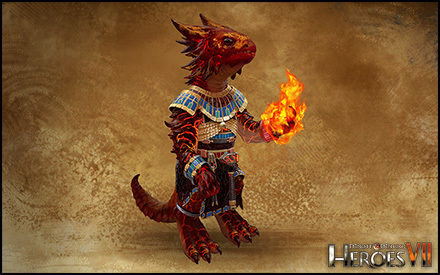 We highly recommend you to check out the Academy update when this one will be available in order to discover creatures 3D renders! Cabirs are minor spirits of Fire that Wizards summon to help in their arcane forges and laboratories. While not very intelligent, Cabirs are obedient, enthusiastic, and have a natural control over all things fiery. They are tasked with helping building and repairing the Constructs, like Golems and Titans. 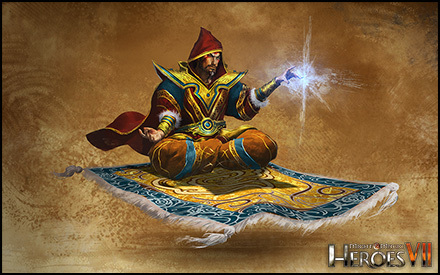 Cabirs that have distinguished themselves in the Wizards’ service – by their skill or their intelligence – may be awarded the rank of Master Cabir. They have a deep knowledge of Constructs and are often found overseeing their maintenance. 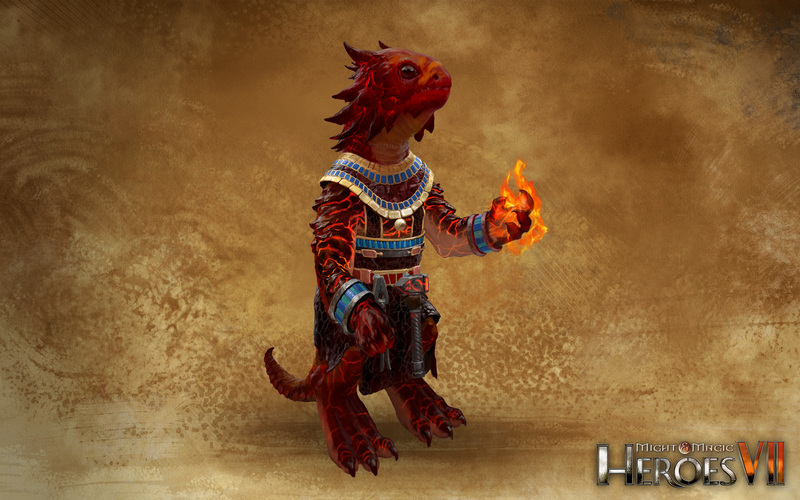 Beings spirits of fire, Cabirs are totally impervious to fire.They actually like being bathed in it. The counterpart to being a spirit of fire is that you tend not to like water. Cabirs can melt the toughest materials with their bare hands, and that’s how they repair constructs. Gargoyles are statues of flying creatures animated by magic. Wizards treat these constructs with care, due to their ability to fly and the tactical advantage they can grant. 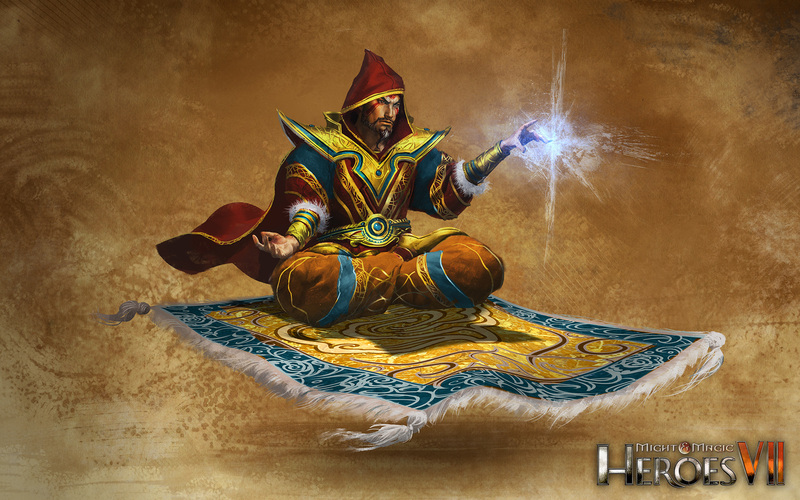 To ensure their longevity on the battlefield, Wizards often imbue them with powerful arcane wards, shielding them from enemy spells. One of the flaws of the first generation of Gargoyles was their relative fragility and slowness, making them easy targets. 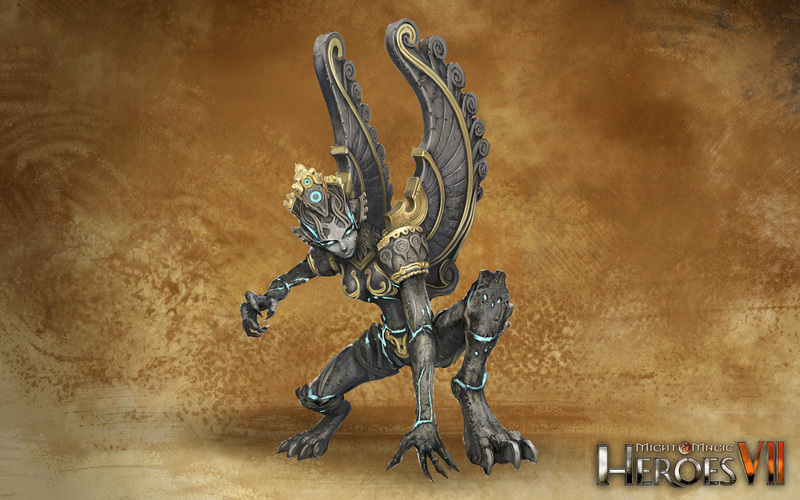 The very substance of the Obsidian Gargoyles is far more durable, and their conception allows them to fly longer distances as well. Gargoyles are not alive, they cannot be healed or resurrected, but they can be repared... The Gargoyles are so well designed that they are totally impervious to magic, a great defense against other Wizards’ armies. 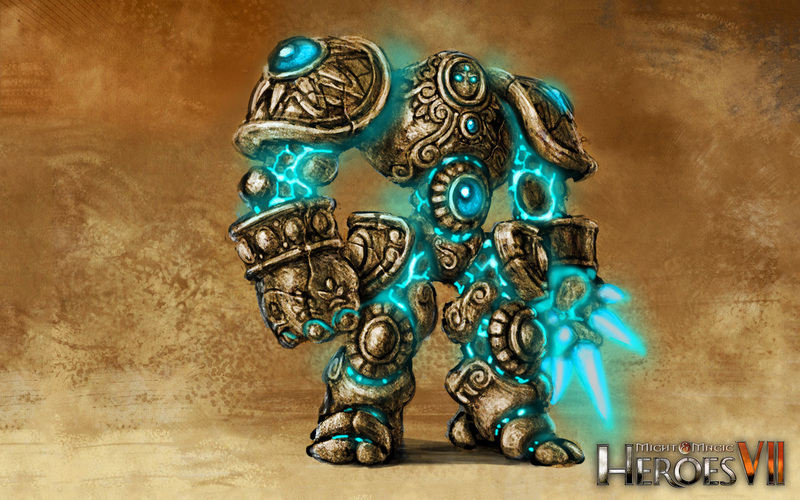 Golems are magical constructs that are used as primary battle units by the Silver Cities. 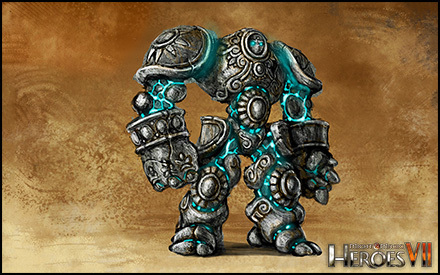 Golems come in all sizes and shapes depending on who built them but they are generally humanoid, heavy, and relentless. Golems have flaws, the most obvious being their sluggish and lumbering nature. 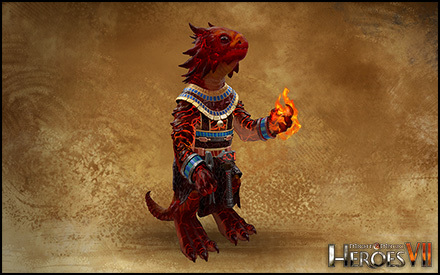 Therefore, the Wizards have spent a lot of time looking for ways to make Golems lighter and more agile. Their latest experiments have parts made of ceramic arenite, commonly known as “sandstone”. 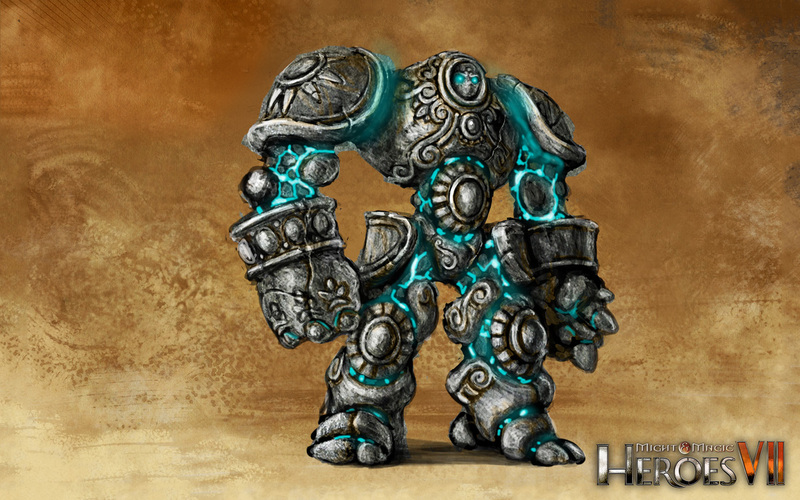 While Sandstone Golems are no Elven dancers, they are noticeably nimbler than their predecessors. Golems are not alive, they cannot be healed or resurrected, but they can be repaired... Golems can’t seem to be stopped or slowed, they just move forward. 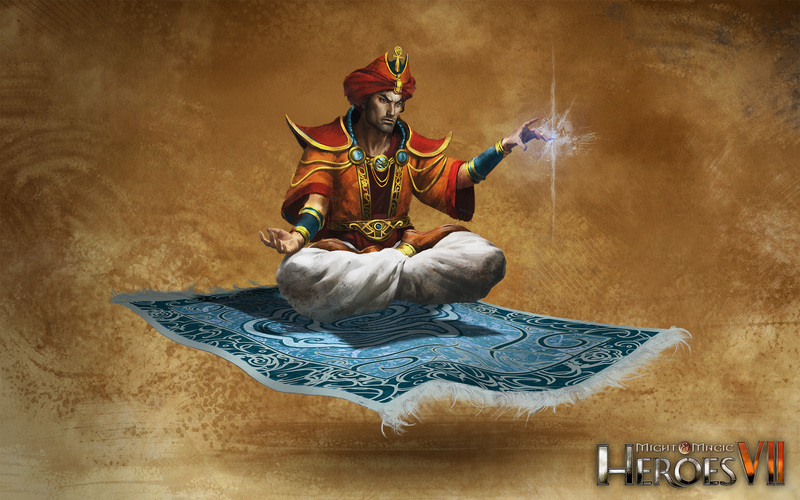 Djinns are humanoid spirits from the Plane of Magic, and are considered to be reflections of the power and brilliance of Sar-Elam. 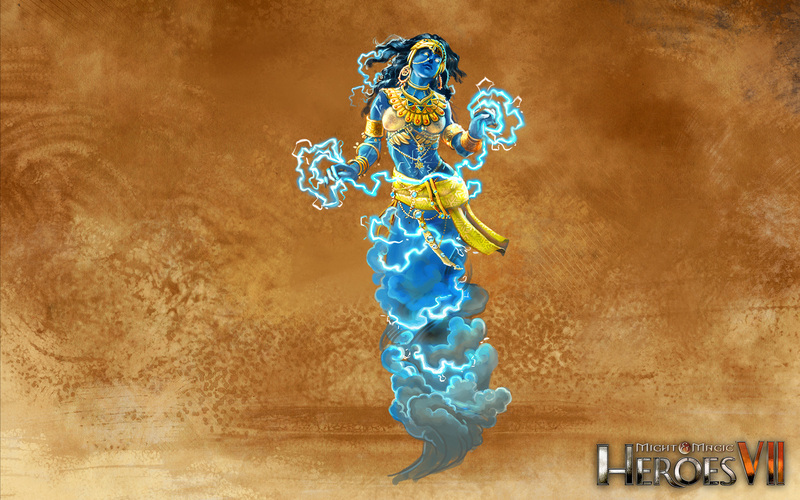 Depending on where, when, and how the Djinn is evoked, it may have a male or a female form. 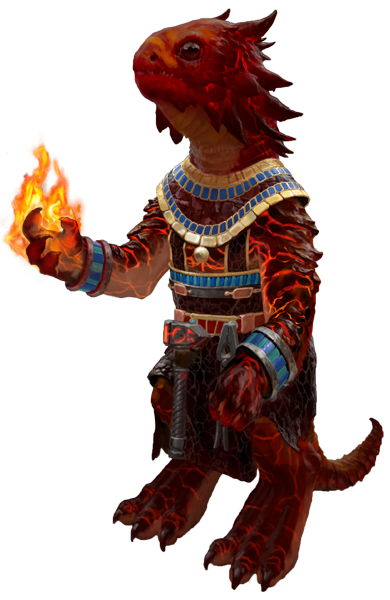 Djinn Channelers are valuable allies for the Wizards, as their mystical knowledge and natural affinity for the currents of magic can strongly influence the scope of a Wizard’s abilities, but also cause nasty magical effects to the Wizard’s enemies. 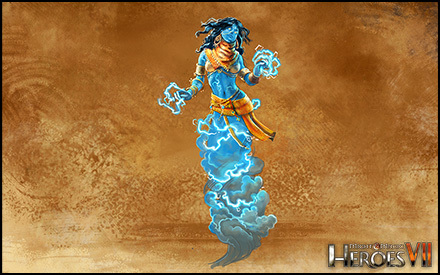 Djinns are able to drain mana from their enemies, and channel it to their master, a valuable power for wizards. Djinns being pure primordial spirits, they are immune to Prime Magic. 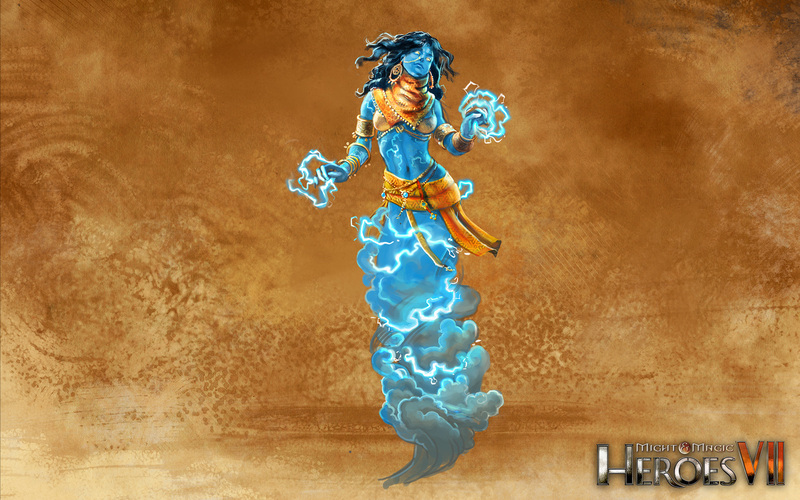 The Djinn Channeler’s touch is so magical that it triggers random magical effects on their targets, making them more susceptible to further spells or magical attacks. 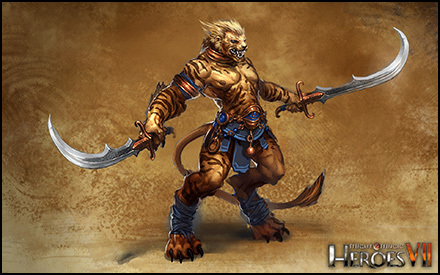 Rakshasas are half-human, half-feline Beastmen. 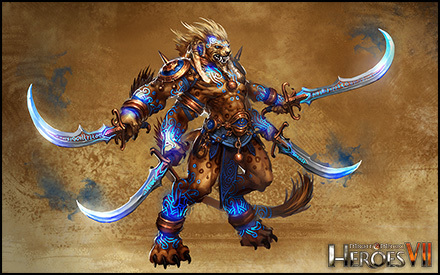 Combining their feral speed and reflexes with a superior training in swordsmanship and the gift of enchanted weapons from their Wizard masters, the Rakshasas are arguably the single most dangerous hand-to-hand fighting creature on the surface of Ashan. 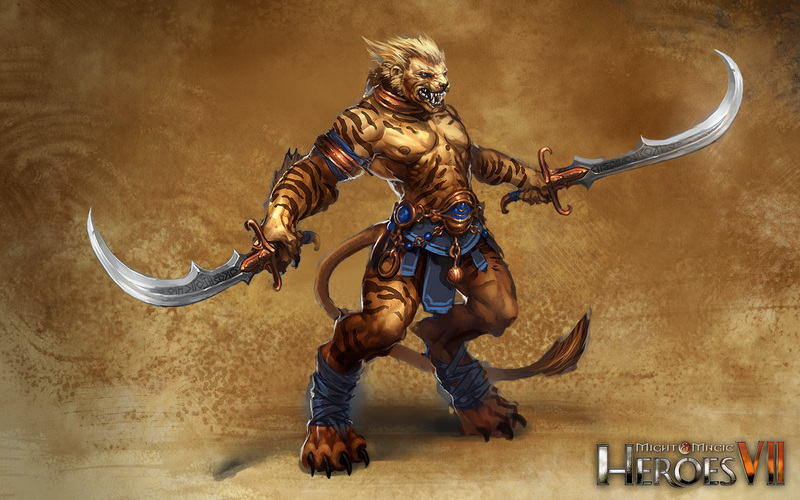 The formidable Rakshasa Rajas are magically-empowered. Most are granted an extra pair of arms covered with protective tattoos, and the most powerful are imbued with the essence of ancient Air spirits, making them even more swift and agile. 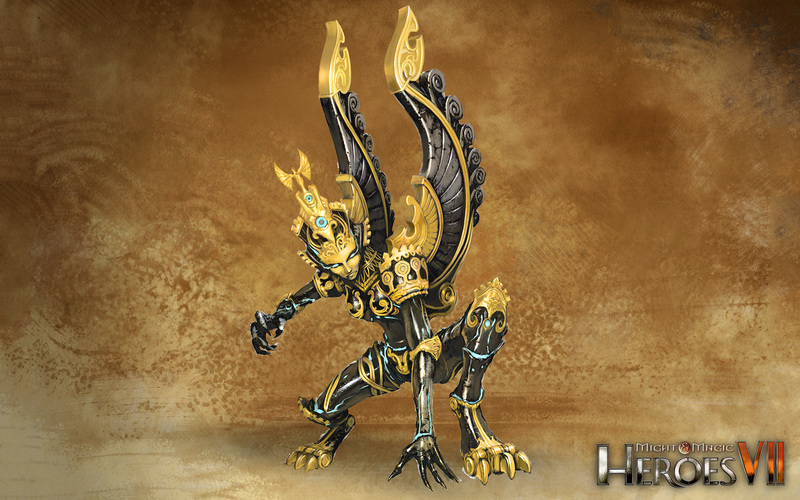 Rakshasas are so fast and accurate that their attack is simply not possible to counter. Rakshasa Rajas are able to strike multiples enemies at the same time, using their additional arms! Joining one of the Academies of Magic is free, but students – regardless of age – are requested to take part to a four-year Tour of Duty in the Wizard armies. During their first two years, they have the rank of Apprentice. During the last two years of their Tour of Duty, students gain the rank of Disciples. They must manage the new Apprentices, while being under the authority of a Master themselves. An elder Wizard or Blademage, the Master teaches his Disciples the art of magical warfare. The prime magic projectile casted by Apprentices can pierce through multiple enemy lines, causing tremendous damage when well positioned. Disciples can channel the energy of their magical attack into a bursting bolt that damages an entire area of the battlefield, making them very efficient against turtling troops.